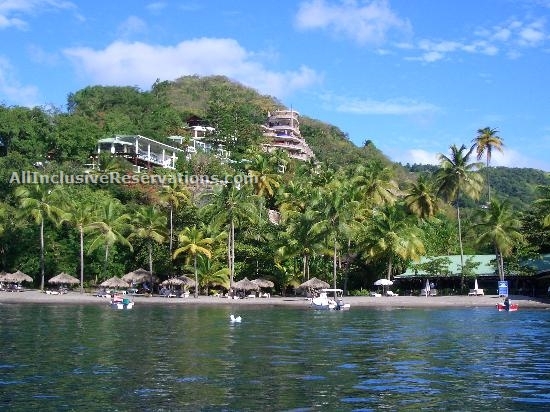 Anse Chastanet, this romantic resort hideaway offers 49 individually-designed rooms, decorated with stunning original artworks, in a unique hillside/beachfront setting. The hotel has created a resort in harmony with its natural environment, taking full advantage of the amazing scenery. Nestled within a 600-acre estate with two beaches, Anse Chastanet is a destination within itself, offering many facilities and activities offered right at the resort. The beaches are on some of the island’s best coral reefs for snorkeling and scuba diving. Within the estate lies a lush tropical forest with 18th century remains of an old plantation, plus 12 miles of private estate trails to explore by foot or bike. 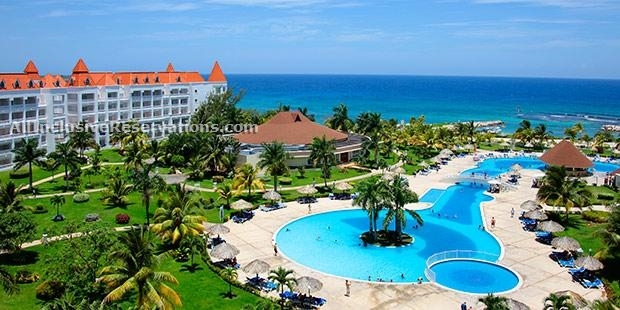 Azul Beach Hotel, by Karisma is located in the beautiful Bahia Petempich in the Mayan Riviera. 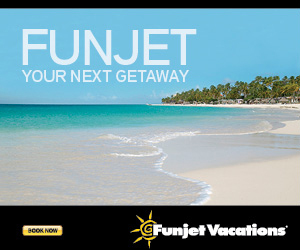 Just 20 minutes south of Cancun Airport, 25 minutes south of downtown Cancun, 40 minutes north of Playa del Carmen. An intimate 90 room resort hotel that lies amidst lush vegetation on a spectacular stretch of white sand beach overlooking the crystalline turquoise waters of the Mexican Caribbean, the hotel provides an unrivaled Mexican vacation experience for couples and families looking for a perfect vacation with personalized service and exquisite details. Featuring the renowned Gourmet Inclusive concept, The Azul Fives Hotel, by Karisma features oversized, luxurious, tastefully designed 1, 2 and 3 bedroom suites. The hotel was designed to offer and meet the needs of guests through flexible meal plan options. The Azul Fives Hotel, by Karisma is strategically located in Playa del Carmen on the Riviera Maya, Mexico, just 35 minutes from Cancun International Airport. Experience convenience first hand with the charming restaurants, shops and local attractions of downtown Playa del Carmen, only 10 minutes away. The area is overflowing with popular attractions, including the notable selection of world class exclusive championship 18 hole golf courses only minutes away. Featuring the renowned Gourmet Inclusive by Karisma concept, the AZUL Sensatori Hotel brings together spacious facilities with unlimited activities and services. The AZUL Sensatori is designed to allow couples, groups, wedding parties, families and friends from all generations to reconnect under the sun. The AZUL Sensatori Hotel is ideally located in the beautiful “Bahia Petempich” in Riviera Maya, Mexico. Just 20 minutes south of Cancun International Airport, 25 minutes south of downtown Cancun, 35 minutes north of Playa del Carmen and 30 minutes north from the Mayakoba Golf Club. Request A Quote… offers detailed room categories and prices, plus more information about the resort. Upon arrival, guests are met by the dedicated staff for Al Fresco check in with a chilled glass of champagne and a cold, fragrant towel. The Majordomo will provide an aromatherapy menu and pillow menu to customize each suite. A personal chef will be on hand to prepare gourmet meals using some of the freshest ingredients, including some grown in the greenhouse located on the sister property of El Dorado Royale, by Karisma. The Villa’s modern design and stylish furnishings offer all the comforts and convenience of home, while the incredible view of the Riviera Maya, its turquoise sea and the gentle breeze whisper, Relax. You’re in paradise! For those mixing business with pleasure, the Villa features a state of the art private office with WiFi, video conferencing capability, a large screen monitor, surround sound and more. Enjoy your surroundings even while working, with the large picture window in the office that faces the ocean. The Gourmet Inclusive experience begins even before arrival, as guests are invited to contact the Majordomo ahead of time to make any requests to customize their stay. With a breathtaking ocean view, six spacious bedrooms and plenty of luxurious amenities to delight the most discerning traveler, Azul Villa Esmeralda, by Karisma offers some of the best in luxury vacations. 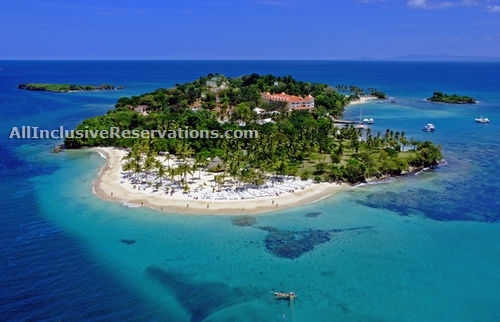 The brand new Luxury Bahia Principe Bouganville is a colonial style, all-inclusive resort located on powdery-sand beaches along the eastern shore of the Dominican Republic. This adults-only resort features a wide array of restaurants, bars, non-motorized watersports and activities. Catering to singles and couples, with the exclusive services of the Luxury Bahia Principe brand, the new hotel emerges as a bright star in one of the most iconic destinations of the world. Cayo Levantado, one of the world’s most beautiful islands, is the ideal place to enjoy a luxury holiday in an incomparable setting of nature and comfort. This marvelous hotel provides all the facilities necessary to make your holiday a dream trip. Sunbathe in the great solarium, refresh yourself in the swimming pool and Jacuzzis or take a delightful swim at one of Samana’s best beaches. Combine rest with relaxation and moisturizing treatments, massages and hydrotherapy at the BahiaSpa, or get in shape on the jogging circuit or tennis courts. The colonial style Luxury Bahia Principe Esmeralda, Don Pablo Collection, has exquisite decoration, complete luxury and is a real oasis of tranquility and relaxation paradisiacal beach. The hotel has a wide variety of facilities and services plus free access to all the services of the Grand Bahia complex. 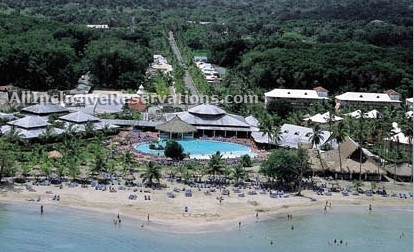 The hotel is situated on three kilometers of fine white-sand beach including a plantation of coconut palms. An offshore coral reef forms a natural barrier thus creating a swimming pool of turquoise-blue water. A truly breathtaking setting! There are 6 restaurants including the French* “Chez Palace”, the “Bohío” specializing in rice dishes, “La Piña” Grill, “La Brisas” offering seafood, “Rincon” boasting Dominican cooking and the “Caribe” buffet. (Note: $20 surcharge on Chez Palace and El Fuente in the Casino center.) Guests have access to the many facilities in the complex: giving a total of 15 restaurants or grills, 16 bars, 3 discos, 2 theaters and a complimentary pass to the “Tropicalísimo” cabaret show in the Casino Hotel. The crown jewel of the Barcelo Bavaro Beach Resort complex welcomes you to the clear, calm waters and pristine beaches of Bavaro Beach. This 1,366 room mega resort is located right on the beach. The resort also features a new Club House addition home to the new restaurants, shopping center, sports bar, spa, casino, and much more, designed in a Las Vegas-style promenade with a Caribbean flair. You decide whether to lounge on nearly 2 miles of sugary white sand beach or to seek adventure and action with a wide selection of on-site water sports. As one of three hotels inside the Barcelo Bavaro Beach Resort complex guests also receive full access to the neighboring hotels and complimentary transportation services throughout the resort complex. Avid golfers will appreciate the value of one free green fee included every other day during their stay. Expect to live well when you are a guest of this resort. Each of the comfortable rooms and suites comes with spectacular ocean view, just steps away from an incredible selection of on-site a la carte restaurants, shimmering pools, exciting daily activities, sports, entertainment, fun for the kids, and of course the most attentive world-class service. The Hotel Barcelo Huatulco Beach is located near the downtown area along the beachfront, just 25 minutes from Bahias de Huatulco International airport and 10 minutes away from other major attractions. The hotel has three restaurants, three bars and an indoor theater presenting spectacular shows every night. The hotel is surrounded by beautiful landscapes, as well as a small shopping area where local arts and crafts are sold. There is also an 18-hole professional golf course nearby, as well as snorkeling areas, coffee plantations, waterfalls, deep sea and small game fishing, crocodile tours and the Mazunte Turtle Center. Puerto Escondido and the Oaxaca archaeological city are also popular area attractions. The Barcleo Karmina Palace Club Premium hotel is a spectacular feat of architecture inspired by the Mayan temples. 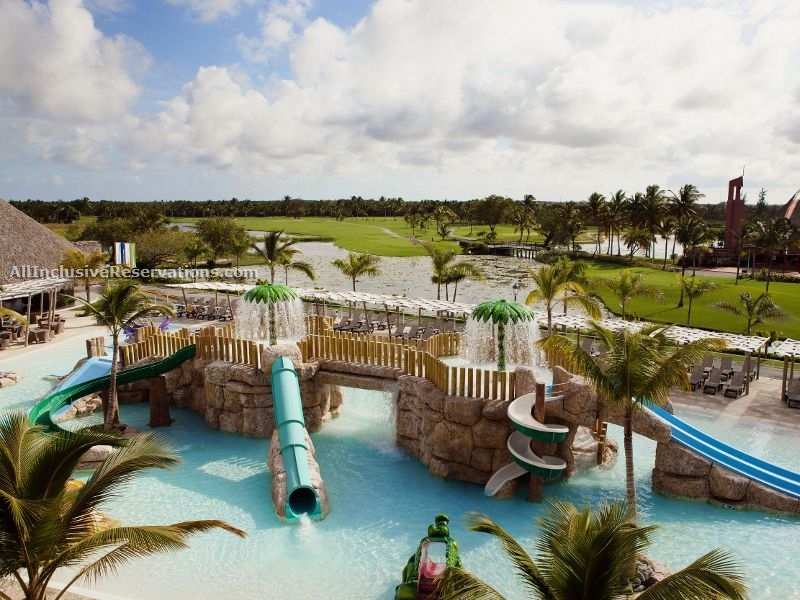 Its tropical gardens with palm trees, along with 6 interconnecting swimming pools with waterfalls, create a romantic and relaxing paradise in a place brimming with fun for all the family. This hotel offers 324 luxury suites fully fitted with everything you need for a comfortable stay. In addition, all suites have balconies and excellent views of either the tropical gardens or the sea. The Barcelo All Inclusive program has been designed to ensure your complete satisfaction, enabling you to enjoy the 4 restaurants and their varied cuisine from different countries: Japanese, Mexican, Italian and international. The adjacent Barcelo Maya Beach & Barcelo Caribe Hotels are spectacular all-inclusives with a total of 1,020 rooms, including 30 Junior Suites and 5 Master Suites. The entire complex is built in Mayan architectural style, perfectly located on the beach amidst lush tropical gardens. The property is on one of the most beautiful beaches in the Mexican Caribbean, lying along 1.5 miles of white-talcum sand and a coral reef.